Full extension with a jump (and a clap). That’s how you do burpees, folks. I coached the 9, 10, & 11 am sessions and attended the noon WOD at CFD today. It was the 3rd Annual Xander Tribute. 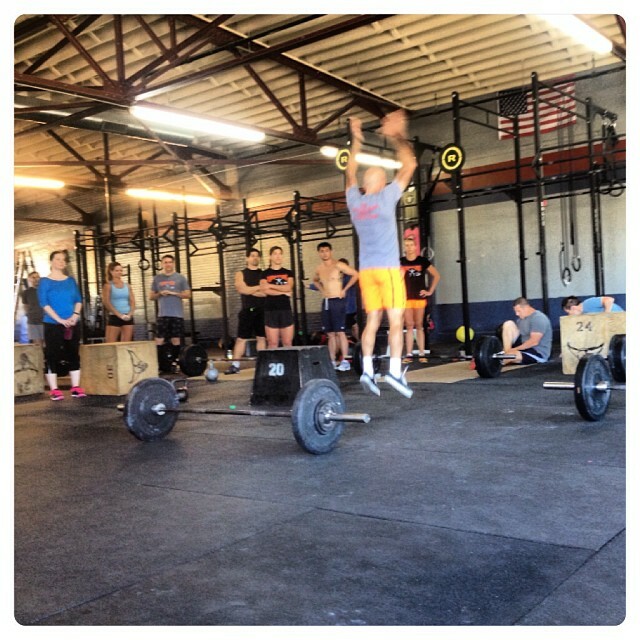 While it is a very sad occasion, coaching the WODs was a very welcome distraction. All four sessions were well attended, and Surmounties were well represented. It was also nice to reconnect with CFDers that I used to coach. I had been secretly wishing that an odd number of athletes would attend one of the sessions so that I could participate as an athlete. This didn’t happen until noon, when Liz said that she was looking for a partner. Yes! Liz is an endurance athlete that I used to coach. Let’s see, endurance athlete and an endurance WOD. I jumped all over that. 13 reps because Xander lived 13 years. 170 and 130 lb for deadlift because Paul weighed 170lb before starting running with Xander and 130lb when he first joined CFD. Run 200m because you’ll run a combined distance of 2 miles, the minimum distance Xander and Paul walked/ran every day. Liz began the first round, and we immediately took the lead. And we kept it. We completed the WOD in 29:51, the fastest time of the day. After having completed this WOD solo yesterday, today felt very, very easy. I completed all rounds of all activities unbroken, although I did re-do a box jump as I may not have fully extended hips before jumping off of the box. Yesterday the wall ball felt like it weighed 40 pounds but today it felt like it weighed a mere 10 pounds. Yesterday the kettle bell felt like it weighed much more than 52 pounds but today it felt like it weighed a mere 35 pounds. Surprisingly, dead-lifts felt much, much lighter today, and I completed all rounds unbroken and very fast. Next ›This blog may be lacking in details.